Smart, sturdy, stunning, sustainable; these are all terms that can be used to describe the ecotots “high-quality, full-line of environmentally friendly, real wood modern furniture”. Yet the most novel aspect of the furniture designed by ecotots is its simplicity. So how does one go about designing a logo that says all of this? When considering ecotots’ designs, “simplicity” is to be taken in that most thoroughly thought out, minimalist sense (think Charles and Ray Eames, think wood, and then take away the screws, bolts, nuts and glue). Keeping with the idea that no hardware should be required for assembly of the furniture, ecotots cofounders Scott Willy and Jay Slifer wanted their logo to communicate the same. As Scott explains, the image of the two ellipses joined by the ecotots patented ‘lip and groove’ was a natural progression when designing the logo. Tell us about creating the ecotots logo. [It came] from the very product itself… ecotots furniture. Yes, the product came first… Then the name… then the logo… then the mark. What designers worked on the final look of logo?? Myself, Scott Willy and my design partner, Jay Slifer. 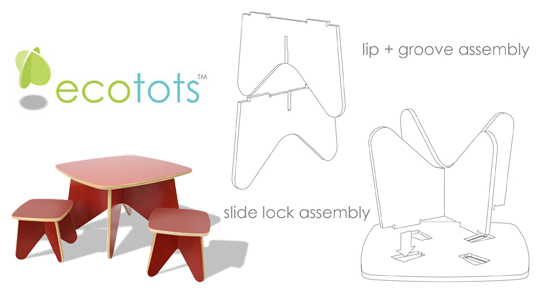 I co-founded ecotots which is one of three design-based companies I own. I am a designer by trade, as is Jay. Jay and I are also the product designers of all ecotots products.? How long did it take to get the logo from rudimentary sketches to the final polished product? Not long at all… A couple of days as I recall. Since Jay and I knew, all along, we wanted some type of an “interlocking” interpretation for the mark to help explain our no-tools product attribute, once the current ecotots logo was sketched, it came together (no pun intended) very quickly. We made very few modifications to the mark in development. We did look at many other marks and names, however. What other names or marks were considered? It was a typical brainstorm of names/ideas… everything one could imagine. How is one expected to interpret the logo with its lower-case letters and interconnecting ellipses?? As I mentioned… because all ecotots furniture slips together without the need for tools and because it is super eco-friendly (green) kid’s product (a modern kid’s product to be specific), it made perfect sense to create a lowercase (kid friendly) word mark using Century Gothic to communicate “modern”. In addition, and while it was not the impetus of the mark itself, the ecotots interlocking disc logo is seen as a green globe. A perfect, added value interpretation for our brand and mission. I usually ask if any sustainability concepts went into the logo design. But with ecotots that’s obvious. So my question to you is: How hard was it not to go overly eco when designing the logo? Because it’s a kids’ product, kids see things in an inspired, simplistic and trusting way. We didn’t want anything to get in the way of this. Plus, when one of the designers is also the client and co-owns the company, it makes things a bit easier. And when both designers of the logo are also the designers of all the company’s products and its entire brand platform (yes, Jay and I do everything), there is no red tape… No politics… And most importantly… No egos. ? Is there any element that is generally misinterpreted about the logo? Not that we have heard about… Which is a first – for me at least. I have designed my fair share of logos and names over the years and have heard plenty. But for some reason, people respond extremely well to the ecotots mark. I can’t quite put my finger on it. I am very happy this is the case, though. As brand developers at three-sixty group, it is only natural that what Scott and Jay have created at ecotots is furniture Cookie magazine says are pieces “to have and to hold” and Dwell calls “pint size props for your mini Matisse or Picasso”. Scott and Jay do all of the mathematical and ergonomic crunching in the back room, so that what is presented in the from room is in its most basic yet fully functional form. We love Ecotots at our store and find their simple, fun designs and easy construction the perks of going green in baby/child's room. We especially love their surfboard growth chart. Smart, sturdy, stunning, sustainable; these are all terms that can be used to describe the ecotots �high-quality, full-line of environmentally friendly, real wood modern furniture�. 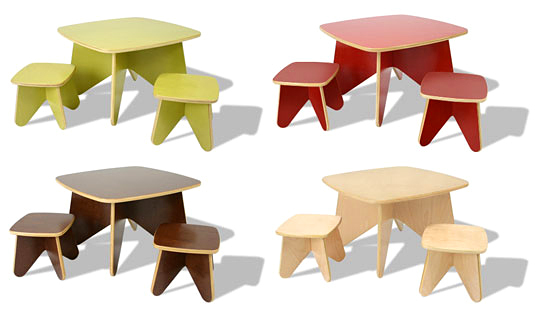 Yet the most novel aspect of the furniture designed by ecotots is its simplicity. So how does one go about designing a logo that says all of this?